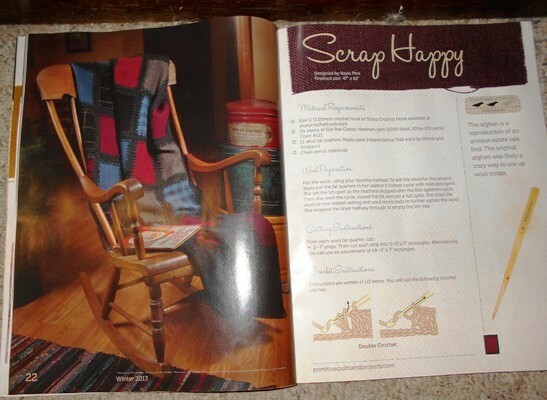 and there is our daughter Kayla’s project featured!! WOW. I tried and tried and tried to take a picture that didn’t glare. No luck. Sometime ago at our thrift store I bought an afghan that was similar to this. I showed it to Kayla. She’s really good at pattern reproduction so she took the afghan home in hopes of creating one of her own. You can’t tell from the pictures (at least not mine) that the colored rectangles are wool fabric and what connects them together is crochet. The old original had grey woolen squares and red yarn connecting them. That was nice but I like Kayla’s version much better. I know she used Moda’s amazing woolens from Minick and Simpson’s designs. Aren’t the colors wonderful?? I just love it…the reds with pops of light blue. It was such a surprise to see it in the magazine. The last time I saw it Kayla was struggling to find a way to get dog hair off it so she could send it in to be photographed. Honestly…you never know what is going on behind the scenes of a designer’s world. I am so impressed to see this in print. As a mom it’s so fun to share in the kids’ special moments and say hey…that’s my kid!! 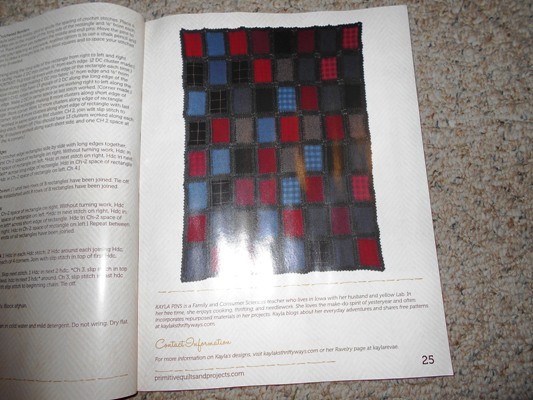 This entry was posted in Family, Quilting on October 11, 2013 by Jo. The quilt is a fabulous design. Congrats to Kayla! How fun is that? Looks great, Kayla! Congrats! That is so beautiful! The design is very special. What a proud mom you can be! A friend just gave me a big box of wool pieces – beautiful samples from manufacturers of scarves and throws. I make small quilts from skirt-weight wool, but these samples are heavier weight. I’m going to try this pattern. Thanks to you for the thrifting, and Kayla for the pattern. What a great week! That wool project is so awesome! Wow! That is a lot to be proud of. Congratulations to everyone! Spoken like a proud mama!! All of your kids are doing sew well!! Good for you!! And good for Kayla! Can’t wait to get my copy!! I have one of those blankets tucked away in a drawer from my grandmother. It is one of my remaining treasures from her. How very cool is that?! Well done! Sounds like y’all have lots to celebrate! I’ve got some wool scraps that might be just the ticket for this pattern. I haven’t had the heart to part with them.